Kerri Pratt in PNNL's Atmospheric Measurements Laboratory. Enlarged View. Congratulations to Dr. Kerri A. Pratt on her selection for a postdoctoral fellowship in climate and global change from the National Oceanic and Atmospheric Administration (NOAA). Pratt was one of ten researchers that NOAA chose in 2009 as part of its national program to create and train the next generation of climate research leaders. 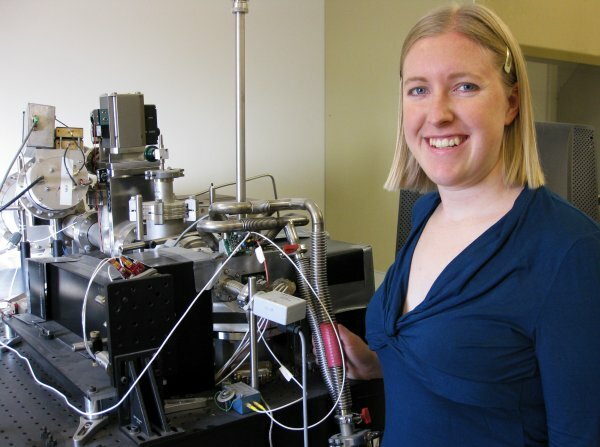 Pratt decided to spend her two-year fellowship, which began in October 2009, at Pacific Northwest National Laboratory. Pratt relishes the opportunity to work with Dr. Dan Cziczo, who leads measurement and instrument research for PNNL's Aerosol Climate Initiative and with PNNL climate physics scientist Dr. Jennifer Comstock. Pratt already had been familiar with Cziczo because of their related research in cloud-ice formation, a little understood yet important aspect in predicting global climate change. "When I was awarded the fellowship, I knew I couldn't find a better place in the United States than PNNL for this field of research," she said. Pratt is part of a PNNL group that will travel to Colorado this winter to study cloud ice formation at the Storm Peak Laboratory. Accustomed to flying through the clouds with measurement instruments, Pratt says, "In Colorado we'll let the clouds come to us on the mountain top." Pratt and PNNL postdoctoral researcher Dr. Gourihar Kulkarni will study ice formation using an environmental chamber, as well as particle analysis by laser mass spectrometry (PALMS) to measure ice residue chemistry. Pratt will then work with Comstock to model the clouds observed in Colorado. Pratt received her B.S. in chemistry at Pennsylvania State University and a Ph.D. in chemistry at University of California, San Diego. While Pratt was finishing her doctoral degree at UCSD, PNNL established an Aerosol Chemistry and Climate Institute with the university. Pratt is a past recipient of the National Science Foundation graduate research fellowship and the U.S. Environmental Protection Agency's STAR graduate fellowship.